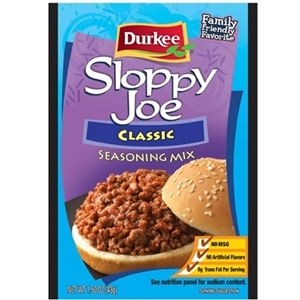 Durkee Sloppy Joe Seasoning Mix features zesty Worcestershire, sweet onions, tangy mustard and savory spices! 1.5 ounce packet. 1. Brown ground beef in a large skillet; drain. 2. Stir in Durkee Sloppy Joe Seasoning Mix, water and tomato paste. 3. Bring to boil; reduce heat and simmer 10 minutes, stirring occasionally. 4. Spoon 1/2 cup meat filling into each hamburger bun. Sugar, Salt, Dehydrated Onion, Wheat Flour, Cornstarch, Garlic Powder, Spices, Worcestershire Sauce (Molasses, Vinegar, Corn Syrup, Salt, Caramel Color, Garlic, Sucrose, Spices, Tamarind, Natural, Flavor), Caramel Color, Disodium Inosinate, Spice Extractive.